Role-playing-game SaGa 2: Hihou Densetsu: GODDESS OF DESTINY aka Final Fantasy Legend II is getting a DS remake. Know what that means? Special SaGa DSi! 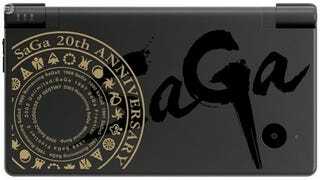 The remake corresponds with the 20th anniversary of the series. If you didn't know that, just take a look at this SaGa DSi. It says just that. And if you didn't know all the names of the SaGa games, this DSi has them written on it. The first SaGa was released on the Game Boy back in 1989. SaGa 2 will hit the Nintendo DS this September in Japan.